The Ice Bears, arch-enemy of the Brown Bear tribe, have entered Chima again! Now, Iceklaw is escaping with the stolen CHI on his super-fast Ice Sledge, helped by Vornon the Vulture. Power up Bladvic with his Fire Harness and Fire Wings and give chase on the awesome Rumble Bear. Fire the ball shooters and evade blasts from Iceklaw’s Freeze Cannon and then transform the Rumble Bear from fire chi power mode into fighter mode. Pose the arms, legs and head of Bladvic’s fearsome battle machine and overpower the rival warriors! Includes 3 minifigures with assorted weapons: Bladvic, Iceklaw and Vornon. Last known price is 56% above the initial Lego retail price! 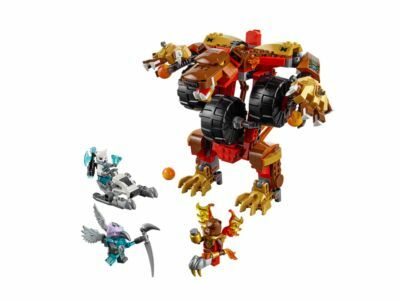 The Bladvic’s Rumble Bear (70225) Lego set is no longer directly available from the sites below. However, 3rd party partners of these sites might still have the set available. Alternate description Stop Iceklaw escaping on his Ice Sledge with Bladvic’s posable Rumble Bear featuring fire chi power mode, fighter mode and 2 ball shooters.